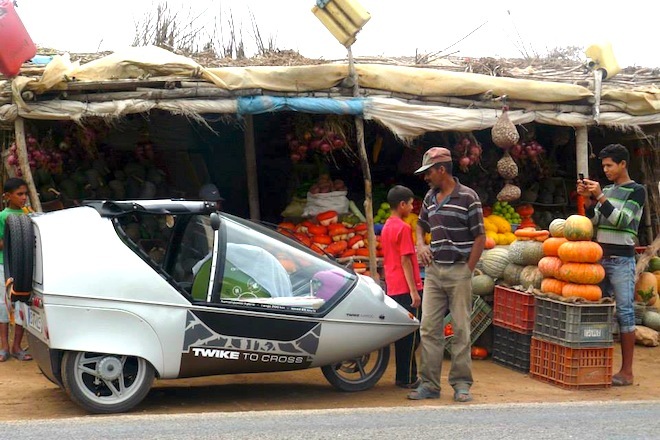 Twikes have been around for 15 years, but they have only now made their way to Morocco. A hybrid electric vehicle on three wheels, this ergonomic two seater can travel 10,000km on the equivalent of just 50 liters of fuel, and you can ride one yourself. There are currently more than 900 Twikes “flying” down roads throughout the world. An eco-friendlier alternative to cars powered by regular gasoline, it relies on both human power and stored electrical power to cruise down the road. Unlike any other light vehicle we’ve seen, all of the Twike’s functions are controlled with a single joystick. It is super lightweight, given that it is constructed out of aluminum and plastic, and uses a lithium-mangan battery that can power the vehicle for up to 300 miles on a single charge. 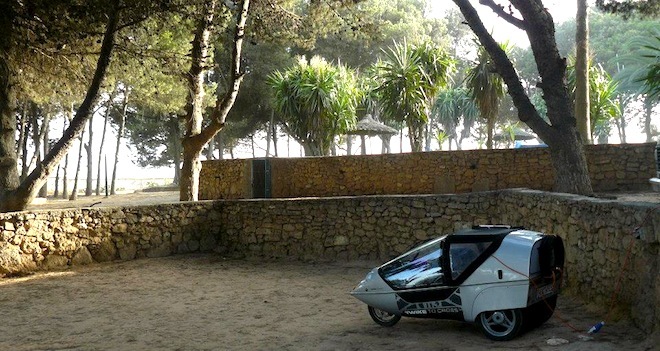 Originally designed by a group of Swiss students for the 1986 World EXPO in Vancouver, the Twike is 100 percent roadworthy and available for purchase. 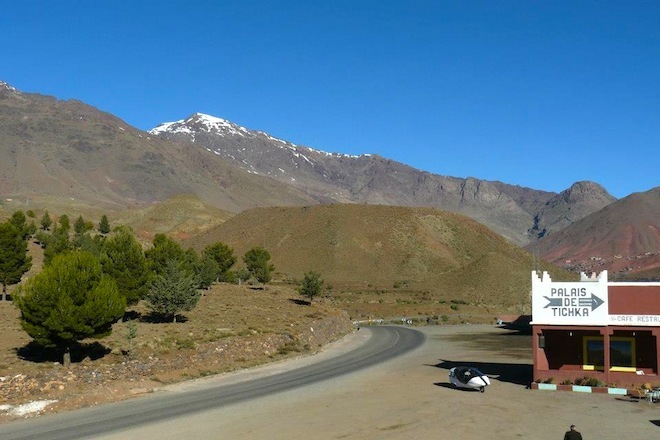 We contacted the folks at Twike Maroc to answer some questions about the vehicles they have for hire, and to learn more about how they made their way to Morocco, but we haven’t heard back from them yet. 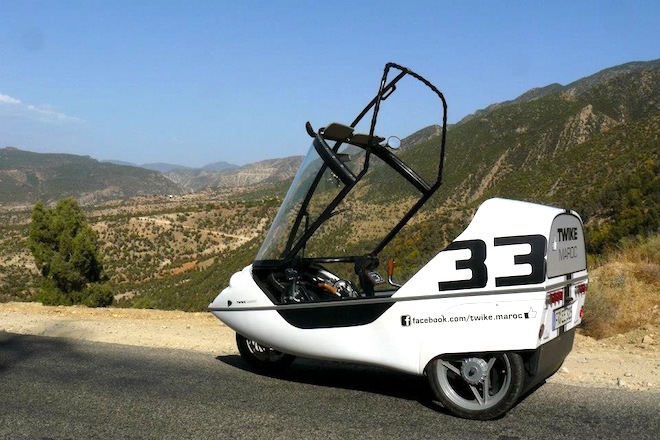 As far as we can tell, it is possible to arrange either a one day tour or a longer trip with Twike Maroc as either the pilot or co-pilot of one of these curious looking vehicles. But we can’t tell you what it will cost, where you will go, or whether you can buy one of your own. 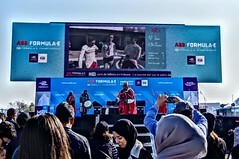 In addition to being an earth-friendly way to travel that also requires a little muscular effort on the driver’s part, resulting in toned legs and improved cardiovascular health, it might be safe than some buses that are known to occasionally careen off the sides of cliffs in Morocco.